It took me almost a month to find out. I should have known my first day. The essence of Cuban baseball is literally right around the corner or in a local park, or in my case, right outside my window. My first morning in Cuba I looked down from my second-story balcony in Centro Habana. Three kids were playing baseball. The street is so narrow the batter stood on one sidewalk while the pitcher stood on the other side. More than five hours later I returned from a day of sightseeing. The same kids were still playing. I asked the biggest kid, who wore an orange, sleeveless T-shirt, if I could take a few swings. He handed me his wooden bat, a good one by Cuban standards, and I hit the first pitch over the second-floor balcony and through the neighbors open window. One of the other boys said, “I’ll get it!” and ran up the stairs. A few seconds later he threw the homemade ball down to us, and we resumed. The fact that I hit a ball into a stranger’s house was no big deal, at least as I could tell by the adults and children who saw it. They didn’t have much of a reaction other than some smiles. After a few swings I decided to organize a game and we found two more kids so we could have a three-on-three game with a pitcher, a first baseman and a fielder. I picked up a crushed soda can on the street and announced that it would be firstbase. Second base would be the apartment number on the side of the building where I lived next to. Third base was a big square rock we found in the road, and home plate was a round paper plate I found in the street. (Havana has the dirtiest streets in the country. The fact it was near Christmas and New Year’s made it even worse, or better, depending on how you look at it as that garbage came in handy for our game). For some reason the two kids on my team wanted me to pitch. 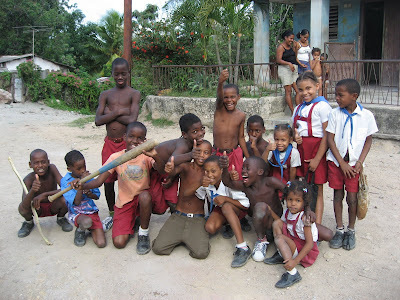 The kids were seven, eight and nine years old, but like most Cubans, played beyond their years. As soon as the game started, I seemed to forget I was playing with kids, cheering on my teammates and yelling advice when I thought necessary. When a dispute arose, they looked to me for the final answer, and would accept, sometimes begrudgingly, what I had to say as the final call. 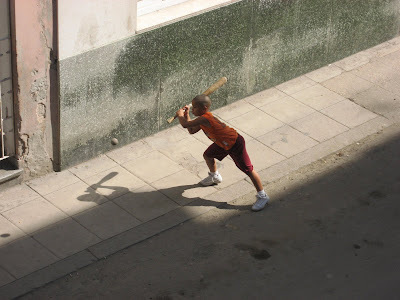 The beauty of the whole game was not just that I was playing baseball in the middle of the street in the heart of Havana. The real beauty was that we spoke two different languages, could barely understand each other and were about twenty years apart in age; yet we both understood the game of baseball and could, nevertheless, enjoy it together. We stopped playing when it became too hard to see as there aren’t many street lights and even fewer that work. I began talking to the first baseman on my team, a seven-year-old kid named Cesar, and his sister, Elianis. She was a year or two older and they both had the same warm smile. Elianis grabbed my hand and smiled, saying, “I want you to meet father.” I said, ok, where does he live? She walked me to her house just across the street. I met her parents, who welcomed me in like good friends. My first full day in Cuba was not an exception. Everywhere I went, I found a game to play, from the farming village of Vinales to special education students in the countryside of El Cobre. They didn’t have bats and balls like most American kids. I saw a kid pitching with a bottle cap as a ball. I saw a kid rip a branch from a bush and use it for a bat. When the branch broke, they used their hands as bats, tossing the ball in the air and smacking it as hard as they could and running the bases. The kids had game. I couldn’t figure it out. For such a baseball-crazy country, no one knew about the professional league. There are no professional sports because the players have the same salaries and lifestyles as everyone else. Still, I wanted to see a game in the equivalent of their Major League Baseball. I asked around. No one seemed to know when the local team played. Or if they did, it always contradicted what someone else told me. I met one guy in Plaza Mella, next to the University of Havana, who upon my asking, crossed the street, found the national newspaper, Granma, and came back and showed it to me. The sports section had the previous night’s results and the official standings. But no schedule. A couple weeks later, in Pinar del Rio, the largest city in Cuba’s western-most province, I finally found a schedule. I met a young man outside the baseball stadium. He asked several workers at the stadium for a schedule but they didn’t know. One guy told me they played three days from then. He was wrong. Finally, someone directed us inside the stadium, through a hallway and into a room, where a young woman sat in front of a computer. She printed out the entire schedule for all 16 teams on a loud dot-matrix printer. Three weeks after my arrival, having stayed in six cities that host baseball games, I finally saw my first game. The home team, Santiago, was playing Pinar del Rio, two of the league’s top teams. The game was not that exciting. Maybe that’s because Santiago lost. 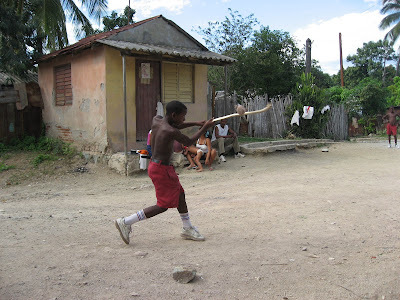 Some fans beat on congo drums, which Santiago is known for in Cuba, throughout the game. Other than that, the games I’ve seen in America or Japan are much more lively. I had more fun going to the game and returning home. I went with a 21-year-old named Alejandro, who lived in the casa particular I stayed. We walked to a certain spot in town and hitched a ride with other locals on a truck. When I walked into the stadium, I didn’t pay. I’m not sure why. Maybe it was because I was eating a ham sandwich and they figured I had already spent some money. Maybe it was because I was with a local. Anyhow, the game was free. The ride home cost a dollar. We had to leave early on Alejandro’s insistence that it was dangerous at night and difficult to find a ride. We flagged guys on motorcycles for a ride home. Santiago is the motorcycle capital of Cuba. 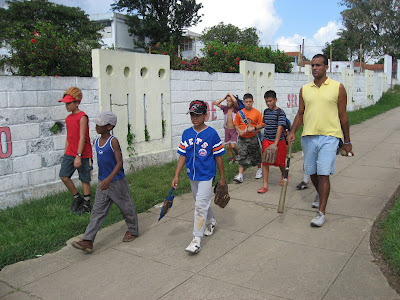 Two days later I was walking down the main shopping street in Santiago when I saw a local, age 22, with a red baseball jersey that said “Cuba.” There are no Cuban baseball league memorabilia sold at any games or stores. I asked him where I could find a jersey of one of the teams, not with the word “Cuba” on it because I might have trouble bringing it back to the United States. He was a reggaeton rapper by the alias “Pucho Man.” He told me he had a Santiago jersey from his friend who played leftfield for them. I ended up giving him a dress shirt and pair of Old Navy jeans for the Santiago jersey and his music video DVD. We were both happy. We had something that was virtually impossible for us to find. When I returned to Havana a week later, the young kids I had first played with shook my hand and smiled when they saw me. That same day, I was walking a few blocks from my casa particular when I saw a young boy tossing a ball and swinging at it alone in the middle of the street. As I walked by, I raised my hand and he threw me the ball. We played pitcher and batter. No words needed. This story first appeared at The Traveler's Pen in February 2007.